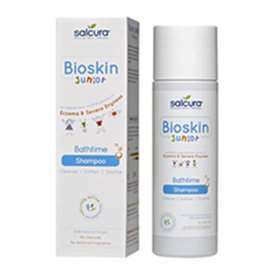 Salcura Bioskin Bathtime Shampoo 200ml a highly effective and easy to use formulation. Ideal for gentle sensitive skin prone to varying conditions of eczema and degrees of dryness. Suitable for babies and children to cleanse, soften and soothe in a child friendly application. Management and control for eczema prone skin. A unique and friendly wash therapy solution. Apply and lather during bath or shower time. Aqua, Rosa Damascena Water (Rosewater),Cocamidoporpyl Betain, Cocamphoacetate, Acrylates/Steareth 20, Methacrylate Copolymer, Polysorbate 80, Pantothenyl Alcohol,(Panthenol), Guar Hydroxypropyl Trimonium Chloride, Glyceryl Isostearate, Calendula Officinalis (Calendula Extract), Laureth 2, Sodium Pyrolidine Carboxylate, Lavandula Officinalis(Laveneder Oil), Anthemis Nobilis (Roman Chamomile Oil), Phenoxyethanol, Piroctone Olamine, Benzoic Acid, Linalool.